Feature Friday: Table Tops Etc. 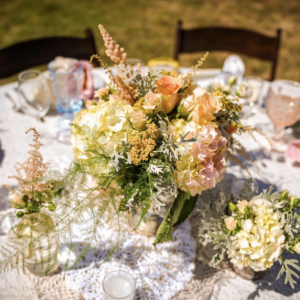 From Our Hearts: The lovely ladies behind the floral design with Table Tops are incredible. I can always tell when they have been hired by a couple at the venue because the arrangements are gorgeous and match the couples personalty and style perfectly. They add so much to our space, I hate to see them leave. How They Stand Out: We source really unique and different flowers, herbs and containers. Visiting antique shops to find vintage hobnail milk glass for container items was one of our recent requests from a bride and groom. The other thing we do is sell linens, chairs and all of the “ETC” items with the flowers for a cohesive look of the tablescape and roomscape. Piece of Advice: Sometimes after all is said and done and you add up your receipts for rental items and DIY products, you may as well have rented from your florist for the $10-15 per container rental cost. Many couples can’t sell items following wedding and don’t get the money back. Also, as for floral trends, consider a gardenia or garden rose for your hair at the reception even if you wear a veil at the ceremony. It can be stored in the bridal salon and Voila, a new exciting look for your reception. From Their Hearts: I love working at the Water Oasis because the venue is yours and yours only for the day. It’s got the most amazing views and the management staff takes amazing care of you. There are so many varied décor possibilities to make the space unique to you as a couple. We would love to help you explore the options! What a Deal! : We offer a 10% discount of floral subtotal for our Water Oasis clients.